I love rhubarb. To me, it’s just the oddest, silliest plant, which also happens to be delicious. I love its old-fashioned name, pie plant, and how it’s such an unlikely addition to pastries, but works so incredibly well. 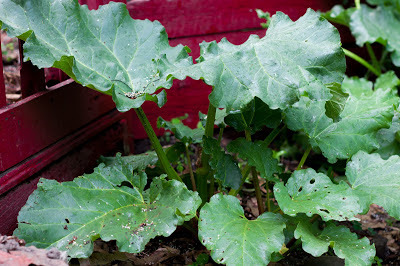 It’s amazing to me that beneath those big, floppy, toxic leaves are deliciously tart and crunchy stalks. The only quasi-culinary use I’ve ever heard about for the leaves comes from Robert P. Tristram Coffin’s Mainstays of Maine, published in 1945. Coffin recommends finding the “biggest rhubarb leaf you can get under your hat,” to ward off the summer sun while crouching down for raspberry picking. Truth be told, Carla and I don’t eat a lot of rhubarb pie or cobbler. 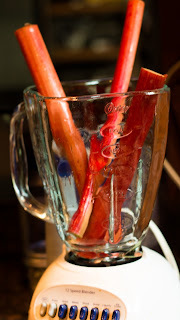 Most of the rhubarb we eat is raw, sliced up over muesli or yoghurt. I haven’t met anyone else of my generation to eat it raw – many people seem baffled by the idea. But for a lot of family members born in the 1940’s and 50’s, they remember chewing on raw rhubarb dipped in sugar, like a candy-coated celery stick. I find the tart bite and crunchy texture to be really refreshing, which gave me an interesting idea. Actually, a ruined dessert gave me the idea. I was making a rhubarb custard, but the addition of raw rhubarb to milk caused it to curdle. Apparently the malic acid in rhubarb, which gives its tart taste, can curdle milk just like lemon juice. So while that didn’t work, I thought about using rhubarb juice like lemon juice. Carla has no taste at all for vinegar. Balsamic, red wine, malt – she despises them all. The only vinegar she’ll tolerate is a bit of my four thieves vinegar used in poaching eggs, which gives the bland, rich egg a more defined taste. But she loves fruit, from incredibly tart kumquats to grapefruit. This has led me to use lemon or lime juice for most of our salads, or segmented grapefruit. Rhubarb juice as an alternative to lemon juice seemed like a fun way to switch up our salads. So I chopped up three stalks, then ground them in a blender. I thought about straining the pulp and just using the juice, but ended up using the pulp as well. This made a very thick dressing when blended with olive oil and salt. I might try just using strained juice next time for a thinner consistency in the dressing. But for this experiment, I was really pleased! 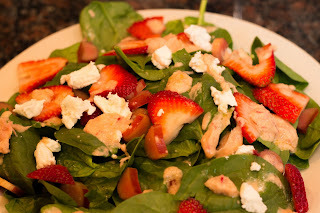 The dressing was perfect over a spinach salad with strawberries and fresh goat cheese. And a few slices of rhubarb stalk, just for a garnish.